Outside the Barclay Street train station, circa 1903 (courtesy LOC). The Christmas tree marketplace had been well-established by then. HOW NEW YORK SAVED CHRISTMAS Throughout the month I’ll spotlight several events in New York history that actually helped establish the standard Christmas traditions many Americans celebrate today. Not just New York-centric events like the Rockefeller Christmas Tree or the Rockettes, but actual components of the holiday festivities that are practiced in people’s homes today. It’s that time of year again, when you can’t make it a few blocks down a street without having to wind perilously by stacks of evergreen trees for sale standing in the sidewalk, the poor things plucked from far away to give New Yorkers a little holiday spirit (and in turn making their apartments feel ever smaller). 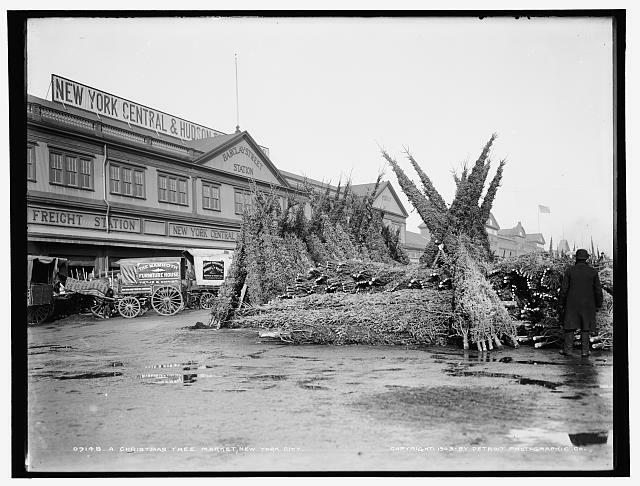 As history has it, the presence of streetside Christmas trees in the city actually predates Christmas as a national holiday (1870). In the mid-19th century, hardly any modern Christmas traditions existed. One that did was the Christmas tree, a pre-Christian ritual incorporated into holiday festivities in German-speaking European countries (Those traditional settlers, the Puritans, didn’t much care for Christmas at all.) Although the tradition did exist in the United States thanks to the Dutch, it was German immigrants who popularized it. As a huge surge in German immigration began in the 1840s, it’s not surprising that New York’s first Christmas tree market — in fact, the first mass-market sale of Christmas trees in the United States — came along in 1851. It doesn’t appear that ‘woodsman’ Mark Carr, living in the lush Catskill Mountains, even celebrated Christmas, but he certainly heard tales of families driving outside of town and chopping down evergreen trees to drag into the city. The go-out-and-get-it-yourself approach probably only benefited the wealthy or anybody with a horse and wagon and the time and energy to travel into the forest and find one. Carr, finding the spirit of the holidays (capitalism) deep within him, thought he’d bring the forest to the city folks. 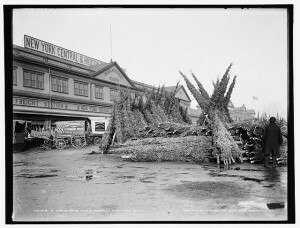 So on the week of Christmas 1851 — things didn’t start so early back then — Carr and his sons chopped down a couple dozen fir and spruce trees, shoved them into two ox sleds, carted them over to Manhattan on a ferry and set up shop in the Washington Market paying one dollar for the privilege of taking up a sidewalk at Washington Market with his rather ungainly merchandise. Holiday revelers were thrilled to be spared the journey out of town, and Carr’s entire stock of evergreens sold out within the day. No surprise this financial opportunity was mimicked by other farmers the next year, and within a few years, the open-air Christmas tree market was born. 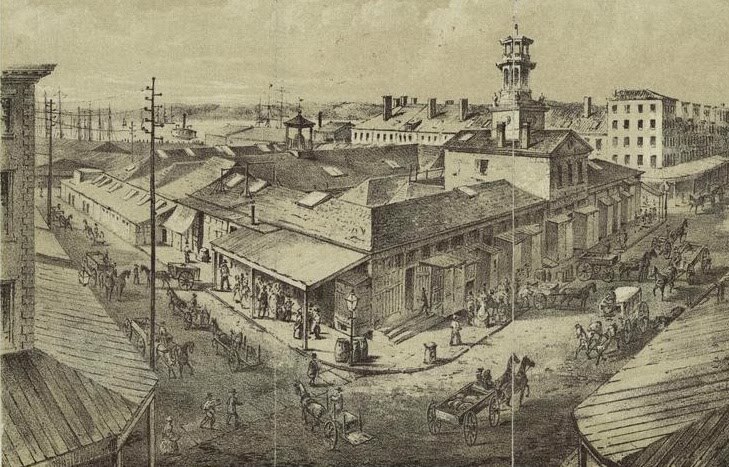 By the way, here’s what Washington Market looked like on a normal day in 1859. 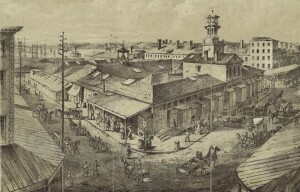 The bustling marketplace, opened in 1812, was a rival of the Fulton Fish Market, and not too terribly far from the Barclay Street Station pictured above. The only remnant of the market today comes in the form of Washington Market Park, sitting where part of the marketplace once resided. Forgotten NY has an interesting write-up on what happened to the market and neighborhood in later years.